However, in today’s era of Cloud technology, it’s becoming more and more self-evident, that small-to-midsize businesses can no longer afford not to address the issue head-on, less their competition beat them to the punch. Today it’s possible to acquire data visualization technology that’s easy to use even for the novice and has built-in analytical capabilities. Carrying out analyses on billions of rows of data while exacting solutions in seconds is obtainable today at a cost that won’t break our SMB pocketbooks. SBA weighs in . . .
To that end, the Small Business Administration is working on proving out use cases pertaining to where big data meets small business. For example, small businesses and retailers can use online transaction history, analyzed in aggregate, to make decisions about sales and marketing programs, better understand customer behavior and predict the number of staffers they’ll need for various tasks. Presidential Contender keen on SMBs . . . So important is this new focus, SMBs and Big Data are even working their way into the 2016 presidential campaign. 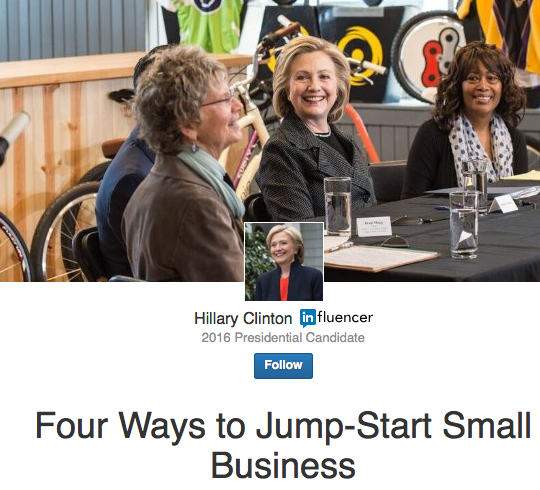 On May 21, Hillary Clinton expanded her social media footprint by joining LinkedIn with an inaugural post about how she wants to be “a small-business president” for the country. In a post titled, “Four Ways to Jump-Start Small Business,” she touted in broad strokes policies she would implement as president to help small businesses. She wrote that she would work to “cut the red tape” holding back entrepreneurs, help small businesses get loans more easily, simplify the tax code and help small businesses access new markets. One could infer one of those new market channels would be benefitting from Big Data. Tracking other Campaign Results . . .
Aside from political campaigns, SMBs are tasked with the need to track results on other campaigns, such as advertising and promotion. Here, merging customer data with media results will help the SMB spend their marketing dollars more efficiently, while evaluating a campaign’s effectiveness more precisely. Overlaying purchase behaviors with impressions can determine which channels are the most effective, which frequency levels drive certain behavior, and how long these behaviors will continue to exhibit themselves. By using Google Analytics and Google Adwords platforms, SMBS can benefit from the search giant’s Big Data to learn what drives leads and sales. With tools that already exist and are free, an SMB can garner the kind of data that heretofore was only available and affordable by big brands. With Google’s tools, today an SMB can now obtain answers to traffic patterns and the sources of referrals to their websites, in no time at all. Most SMBs have switched over to VoIP from their legacy POT [plain old telephone] systems because of its ease, multi-functionality and cost-savings. Bringing VoIP and Big Data together provides a company with the opportunity to expand their business intelligence [BI] exponentially. It can deepen customer engagement every time your call center, front desk or sales department conducts a call with a prospect or existing customer. This is accomplished via an analytics package tied to the service. “Beyond providing more enhanced features compared to traditional phone service, Telzio’s internet-based phone systems enable companies to access their calling data and evaluate it against performance. Over time, companies can accumulate meaningful data specific to their own business,” adds Chu. This business intelligence can then be combined with statistics derived from other sources, such as their customer relationship management [CRM] and partner relationship management and/or help desk systems. The natural fit for IP-based communications technologies and Big Data is understanding these performance statistics. The increase of VoIP for mobile devices means that performance statistics are becoming increasingly more important as well, particularly because many of today’s SMB staff members are located in remote offices. Too Small to Fail. . . In today’s business milieu, there’s no such thing as being too small for Big Data. Keeping up with the latest technologies, software and data providers will allow you to make informed decisions about the right solutions that will work best for your business. So, if you’re looking to stay competitive, consider some of the tips brought to you today and look to the Cloud for future solutions. Big Data encompasses social networks, chat and email correspondences, browsing history and other online and offline data sources. It’s your pathway to unparalleled insights into consumer behaviors and preferences making it easier and easier to improve how you sell and service your clients. Perhaps if Captain Ahab had some of these tools, he might have been able to locate and take down that big whale quicker and without being capsized in the process!